The Handwriting Without Tears® curriculum draws from years of innovation and research to provide developmentally appropriate, multisensory tools and strategies for you. We teach the easiest letters first, and then build on prior knowledge. Letters are taught in groups of similar formation. 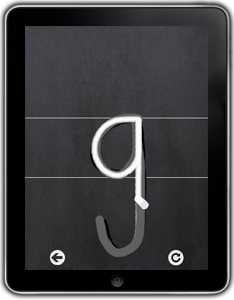 After children master the easier letters, they are ready for more difficult letters. We make it fun along the way. That’s the foundation that Wet-Dry-Try is built on. It makes handwriting easy to learn! The activity works on one letter at a time. Children can master one letter formation before moving on to the next. It prevents and eliminates reversals. One of the most common handwriting struggles young children have is letter and number reversal. 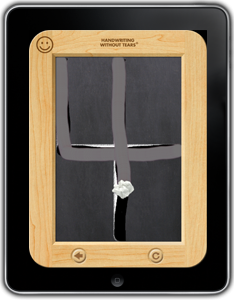 The frame of the virtual Slate Chalkboard and the smiley face in the corner helps students with orientation and correct formation of capitals and numbers. It helps teach older children size and placement of lowercase letters. 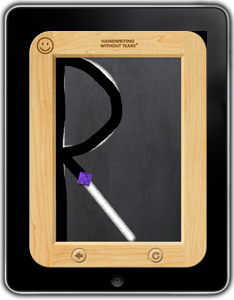 It simulates our Blackboard with Double Lines, a great tool for helping them learn lowercase letter formation. The language is consistent and child friendly. But don’t just take our word for it, see the research behind Handwriting Without Tears. Students can practice formations accurately, with correct start, sequence, and directionality. Verbal guidance from a personal handwriting coach provides instant feedback on errors and also provides positive reinforcement. Students are motivated to progress through the capitals, numbers, and lowercase letters with a game-based format. They can pick any letter and practice capitals, numbers, and lowercase in any order.